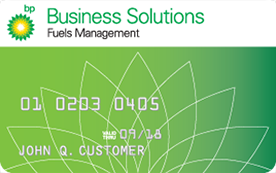 The BP Business Solutions Fuel Card provides your drivers with the highest quality fuels at thousands of BP locations in the United States. This fleet card also gives fleet managers the ability to determine how each card can be used. Stay informed with our reporting, which includes financial data and a Fuel Management Report with transaction data. You’ll receive monthly invoices online free of charge, and paper statements are available for a fee. * Only for fuel purchased at BP-branded locations. Account must be in good standing. Rebates are subject to change at any time without notice. Rebates may not be allowed where prohibited by law and apply only to fuel purchases made at participating BP branded locations in the U.S. Rebate not valid for off-road diesel, aviation, bulk fuel, propane or natural gas purchases. $10 account fee may apply for accounts not fueling 5,000 gallons a month.